During a job interview on a freezing December day, Marty Witrak simultaneously felt the infamous cold of Duluth and the welcoming warmth of St. Scholastica. A quick walk from the Science Center to Tower Hall was all it took. "We came out of the door and Sister Helen Claire Arts reached over and took my hand as we walked across a huge patio area up to Tower," Witrak recalls. "The wind was coming off the lake and I thought to myself, ‘Marty, you are not in Kansas anymore.'" Twenty-five years later, as she retires from her post as dean of the School of Nursing, Witrak reflects that it was the personal connections that she'll miss the most. "There was and is something very special about this community." She has filled many roles. With a background in psychiatric mental health, she taught at Syracuse University for 13 years before coming to the College. Initially hired to run a rural health grant from the Blandin Foundation, Witrak went on to teach in the graduate nursing program and the RN to BS program, serve as director of general education and the nursing graduate program, work in the Center for Healthcare Innovation, and eventually become dean of the School of Nursing. The common thread has been the relationships she's formed along the way. "I loved teaching students, I've enjoyed being the dean, I've enjoyed growing the programs in terms of serving the community, I've enjoyed being an advocate for the College, but really it's all about people for me," Witrak said. "Working with somebody to achieve something you've decided has value, that's what's great. I don't think there's really much of anything I feel like I've accomplished by myself. It is about the team, all of us." 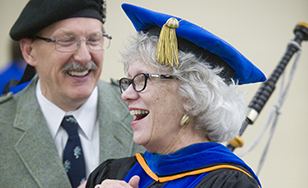 She's proud of helping solidify St. Scholastica's reputation, putting the College at the forefront of rural health care education and growing its student population. "The fact that the School of Nursing now serves as many students as it does - that means there are that many more nurses out there to help people in this region be healthier," Witrak said. Julie Anderson has been named the new dean of the School of Nursing.